Eleon’s direct drive wind turbine is based on a single-sided supported direct drive (SSDD) invention. The SSDD solves the challenging air gap problem of direct drive wind turbines with a pioneering and unique method. The permanent magnet generator is enclosed in the tubular main frame and fixed by a single main bearing to the front end of the main frame, where the stator is connected to the outer ring and the rotor to the inner ring of the bearing. The generator structure floats, i.e. the complete generator might be deflected but not the air-gap. 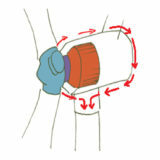 The hub is also connected directly to the main bearing. With this design the main loads are led from the hub through the main bearing directly to the main frame and, in turn, from the main frame to the tower. The invention protects the generator against harmful off-axial loads that may lead to structural deformations and problems with the air-gap. 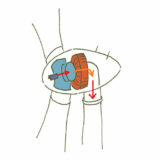 Mainly torque is transferred to the generator. The invention allows for a significant reduction of the nacelle dimensions and mass. 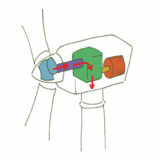 In the traditional direct drive solution the generator is located between the hub and main carrier. The solution does not protect the generator against harmful off-axial loads, which may lead to structural generator deformations and cause problems with the generator air gap. For compensation of this drawback significant air gap incensement and structural reinforcement are required, which increase the nacelle dimensions and mass. Geared wind turbine availability is limited due to the gearbox’s low reliability rate. Even the most reliable gearboxes fail. Most importantly, failures usually occur in high wind season, which greatly reduces wind turbine availability. Eleon © All rights reserved.